Our latest guest blog from Anthony Walker of Kensington residents’ association ESSA details the proposed improvements to Leighton House Museum. Leighton House in the heart of Holland Park was built by President of the Royal Academy Frederick, Lord Leighton as his art studio and home in 1867. He spent the next 30-years until his death working on the house as a way to display his incredible collection of art from across the globe. The distinctive red-brick building with its stunning interiors is now a museum and the only example of a purpose-built studio-house open to the public in the United Kingdom. Grade II Listed, Leighton House Museum is of both national and local significance despite some existing limitations on accessibility but these are about to change with new plans designed by BDP architects. 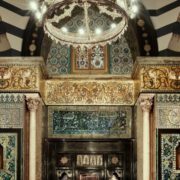 Members of the Edwardes Square, Scarsdale and Abingdon Association (ESSA) will know Leighton House Museum well as we enjoy our annual general meetings there each year. Particular highlights of the magnificent interiors include the tiled Arab Hall built to house Leighton’s collection of ceramics, the grand staircase to the double height studio on the first floor and the splendid display of pictures and sculpture throughout the building. We may have been aware of the lack of disabled access to the upper floors including the studio or the limited study space but not of the large collection of works which have no space for display or the limited space available for the conservation of the collection of over 700 artworks – all of which is being addressed in the new plans. Leighton House, originally 2 Holland Park Road, was built by Lord Leighton and completed in 1867 with assistance from renowned architect George Aitchison who continued to work with him throughout the numerous changes to the original building. The house was originally set in a semi-rural setting which it never totally lost. During the period that Leighton lived in Holland Park the ‘Holland Park Circle’ of artists grew up around him. He travelled extensively but the presence of the house gave him the opportunity to develop his interests as a serious collector of art works which he displayed in the House. The improved Leighton House Museum will provide yet more scope for study not only of Leighton’s own work but also for the colony of artists in the area which include both established artists with purpose built houses and those who occupied commercial studios of which there are several in the ESSA area. An application has now been submitted to RBKC to address space and accessibility issues. The plans include the provision of new accessible entrance to the Museum, a dedicated drawings gallery to display a selection of Leighton’s work, a collections store, a lift and staircase between the lower ground and first floor, WC facilities and ancillary space for the museum’s staff. The proposed work not only improves the museum’s functional space but will better display the historic aspects of the building, including the butler’s pantry in the basement and the discrete stair and ante room to give models access from the ground floor up to the studio. An ugly external metal staircase will be replaced by a modern stair with a lift providing access to all the principle levels of the building. Miscellaneous modern alterations and infill from the 1950’s under the Winter Studio will be removed and the area opened up to provide a multipurpose space, giving a view of the original column structure which supported the Winter Studio. The east wing which today fronts the Holland Park Road is formed by an extension built in the 1920’s designed by Halsey Ricardo, himself an interesting late Victorian architect with a particular interest in ceramics. The extension was designed to provide more exhibition space and will now be opened up at ground floor level to create a new reception area with access back to the historic entrance hall and to the new lift and main staircase. There is much more to say about Leighton House Museum and the tremendous potential the proposals offer. You can find details of the planning application on the RBKC planning website. The ESSA Trustees believe that these proposals will enhance the building and provide a valuable amenity for the community. 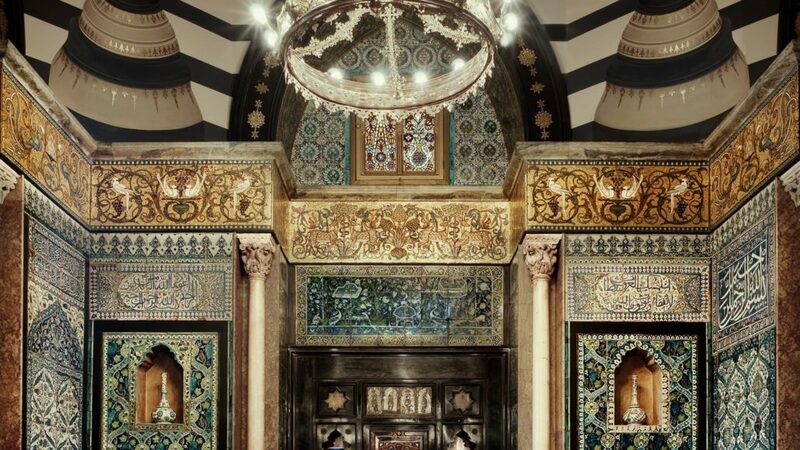 If you’d like to visit Leighton House Museum, it’s open every day apart from Tuesdays. Find out more. Photo credit: Here is an illustration of the space that will be created under the Winter Studio looking north out to the main lawn. Can you please credit BDP architects.